Almost a decade ago, Indiana University embarked upon its first-ever international strategic plan, which offered a bold vision for the university to expand upon and enhance its engagements around the world, thus positively impacting IU students and communities around the state. As a result of the plan, initiated in 2008, IU continues to see record numbers of its students studying abroad. (Today, around one in four IU students will graduate having participated in a form of overseas education.) At the same time, the university has opened its doors to the world’s top students and visiting scholars in an effort to foster greater cultural understanding and more closely reflect the competitive global marketplace IU students will enter after they graduate. IU has more than 1,500 alumni who are affiliated with Japan. Additionally, IU has successfully renewed connections with its international alumni, who continue to serve as great ambassadors for a university that is fast approaching its 200th anniversary. IU’s Bicentennial will commence in fall 2019, and it promises to be — as a result of the university’s continuing efforts to expand its international footprint with the help of its friends around the world — a truly global celebration. Today, another chapter in IU’s longstanding history of international activity begins as IU President Michael A. McRobbie prepares to lead an IU delegation on a weeklong trip to Japan and Australia, two of the most dynamic countries in a region of the world that, increasingly, is playing a critical role in the economic and cultural life of our state. The trip is being organized by the IU Office of the Vice President for International Affairs, led by David Zaret, who will accompany McRobbie at a series of meetings with leaders in education, government, technology, culture and business in both countries. Japan is Indiana’s largest investor, a fact that may come as a surprise to many Hoosiers. Currently, there are 280 Japan-based companies that employ more than 58,000 Hoosiers, and IU joins a number of major Indiana organizations, such as Eli Lilly, Cook Medical, Urschel Laboratories and Zimmer Biomet, in partnering with some of Japan’s leading firms. Just last month, Indiana Gov. Eric Holcomb led a delegation of business and economic development leaders on a trade mission to Japan to further the state’s economic and cultural binds with the country. The relationship between the state’s flagship university and Japan actually dates back a century, during which time IU has welcomed many Japanese scholars and dignitaries to its campuses as visitors. Last year, the university hosted more than 70 Japanese students, and there are now over 1,500 IU alumni who are affiliated with Japan. Over the years, IU has also engaged in a number of important scholarly and research collaborations with several of the top educational and research institutions in Japan. These include a major collaboration with Memnon Archiving Services, a Sony Group Company, on IU’s ambitious Media Digitization and Preservation Initiative, which has led to the digitization of 250,000 precious audio, video and film items for long-term preservation. These collections contain material from a wide range of scholarly disciplines and represent an investment in research and scholarship at IU, spanning many decades, by businesses, foundations and individuals across the Hoosier state. IU’s trip this week to Tokyo reflects how highly engaged the university continues to be in Japan. On Tuesday, McRobbie, Zaret, IU Vice President for Information Technology and Chief Information Officer Brad Wheeler and former U.S. Ambassador to Poland Lee Feinstein, dean of the IU School of Global and International Studies, will participate in a daylong series of meetings with senior officials at Sony. The following day, McRobbie, Zaret and Feinstein will meet with the new U.S. ambassador to Japan, William F. Hagerty IV, as well as with members of the Ministry of Education, Culture, Sports, Science and Technology to discuss the importance of bilateral exchanges between Japanese and U.S. universities. They will also talk with representatives from the Japan Foundation Center for Global Partnership to discuss potential collaborations with IU’s School of Global and International Studies to support the study of Japan at IU and cooperative research. And they will attend a concert at the Tokyo Metropolitan Theater Concert Hall directed by IU alumnus and world-renowned conductor Robert Ryker and featuring recent IU Jacobs School of Music graduate Johann Schram Reed. 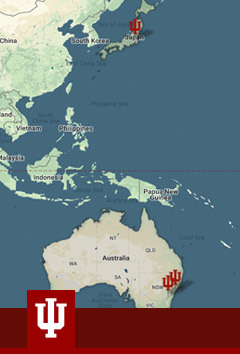 From Japan, the delegation will depart for another country in the Asia-Pacific region where IU’s connections run deep: Australia, a continually popular destination for IU students to study abroad and, over the last decade, an active site for educational and research collaboration between IU faculty and their colleagues at the country’s top academic institutions. 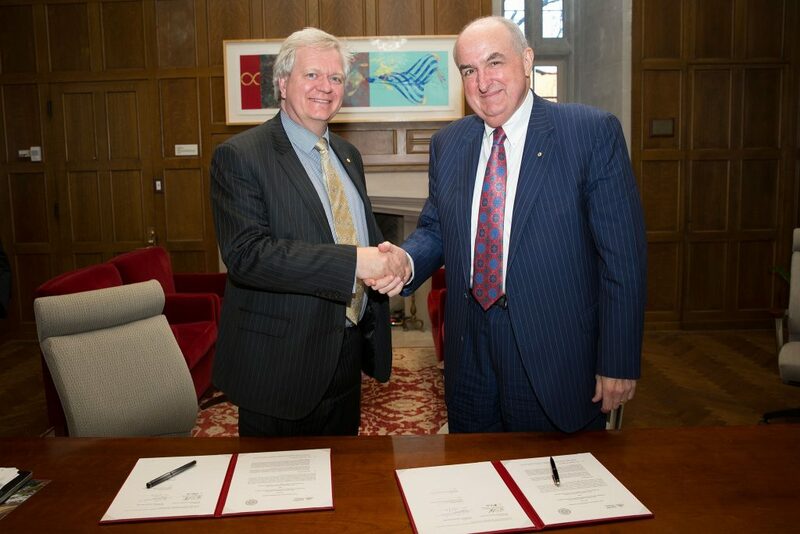 In Australia’s capital city, Canberra, McRobbie will formally extend IU’s longstanding partnership with the nation’s leading university, the Australian National University, which has generated exchanges of faculty, students and staff and supported collaborative research and scholarship led by the ANU-IU Pan-Asia Institute. Established in 2009 and based in IU’s School of Global and International Studies, the institute works on a broad range of issues related to Asia and is one of IU’s most active global partnerships activities. ANU Vice Chancellor Brian P. Schmidt, left, and IU President Michael A. McRobbie. ANU and IU have had an institutional partnership since 2009 that has resulted in student and staff exchanges and collaborative research. The partnership renewal will take place during a joint ANU-IU summit, chaired by McRobbie, an alumnus of ANU, and ANU Vice Chancellor Brian Schmidt. The summit will include faculty from both institutions who will discuss their work and possible future collaboration in such areas as art and design, business, cybersecurity, law, linguistics, public affairs and public health. McRobbie, a native of Australia who became a U.S. citizen in 2011, received his Ph.D. in logic in 1979 and an honorary doctorate in 2010 from ANU. He also received the university’s Alumnus of the Year award in 2015. At the University of Sydney, delegation members will visit the United States Studies Centre. McRobbie serves on the advisory council for the organization, which offers many education programs, including an undergraduate major and postgraduate degrees in American studies and study abroad programs. Finally, while in Japan and Australia, the delegation will meet with alumni who are members of active IU Alumni Association chapters in both countries. And I’ll be there as well in Japan and Australia, sharing details of the IU delegation’s daily activities and providing news, background information and insights into the university’s increasing international engagement in this important part of the world. I hope you will follow along with me, and please feel free to contact me directly with questions or comments at rpiurek@iu.edu. Next up: A report from Tokyo. See you soon.